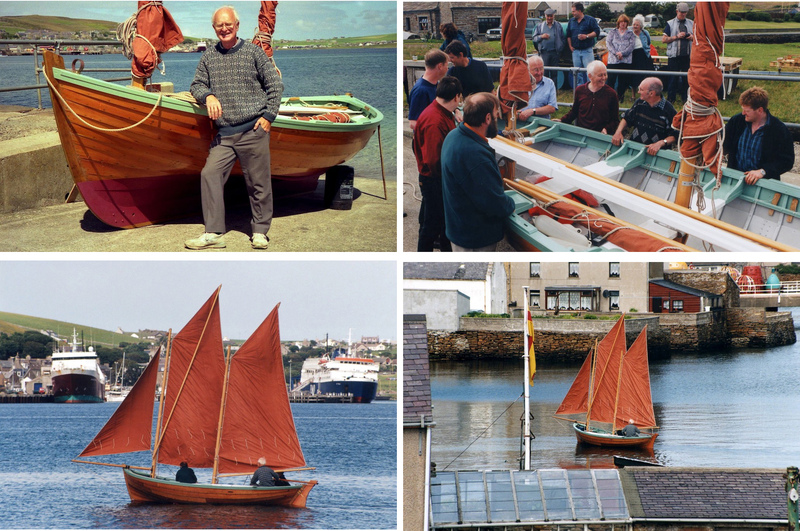 Launch & maiden voyage of Len Wilson's self-built 3-sail yole Gremsa. Incredibly, I didn't record the date. 1998 I think, but that could be well off the mark. Did Len work at Lyness way back in the fifties, I mind a chap Len kept a boat in Orebay, and went home tae Graemsay at the weekends, think it might be him..
Len would have been in his 20s in the 50s, I think. Beyond that I can't help. Maybe he views this site himself and will provide the answer. On second thoughts, I was in my 20s in the 50s. Len Wilson is considerably younger than me. So I doubt if he would be the man you remember Jimmy. yes Allan your right, you jogged my memory , thats the guy I was thinking of, must have been the name Wilson that was in my mind ... long time ago..
Len Wilson worked at Kirkwall Airport before he retired.A keen boat builder and fiddle player in his spare time. I'm a bit slow getting to this site!! I was indeed just a boy when Frank Wilson was at Lyness. I'm not aware of any relationship between us but both Wilson families came to Graemsay from Walls, mine in the 1840s to work on the building of Hoy High and Frank's some time later. Gremsa was launched in July 1999.